Blood Pressure Clinic: 2nd Friday at the Nutriton Center - 11:00 a.m. Durable Medical Equipment! :Free loan of walkers, canes, etc. Watch for more information! Everyone welcome! Sunny View is part of LSS Assisted Living Services, which are part of the statewide network of services for children, families and seniors offered by Lutheran Social Service of Minnesota. All assisted living services listed are offered by any LSS ElderShare Homes. 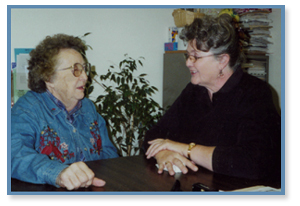 LSS ElderShare Homes offer family-like settings with assisted living services in a caring environment. We provide the full spectrum of daily care and quality-of-life enhancements that lead to a dignified lifestyle. Seniors gain from the fellowship that comes with living together. Each home is spacious and well maintained. Each has well-trained and committed staff on-site 24 hours a day. Staff are always on hand to assist residents, regardless of the time of day or night. Friends and family of LSS ElderShare Homes residents are welcome to visit at almost any time, just as they would visit in an individual's home.